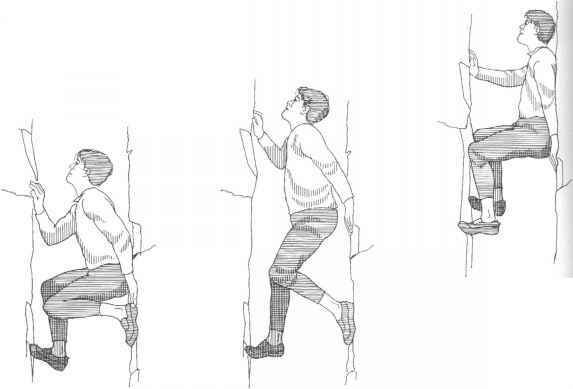 Jumping is the final common tactic for crossing a crevasse (fig. 13-5). Most jumps across crevasses are short, simple leaps. 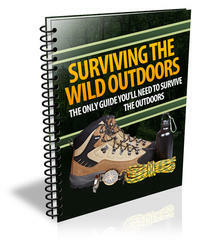 If you're planning a desperate lunge, be sure you've ruled out all the alternatives and see that you are well belayed. Before any significant jump, remove your pack. While belayed, probe to find the true edge of the crevasse. If you need a running start, tramp down the snow for better footing. As final preparation, put on parka, mittens, and hat, check prusiks and harness, and spool out the amount of rope slack needed from the belayer. 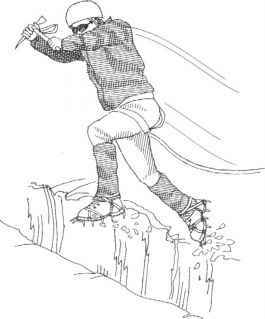 Then jump—with your ice axe in the self-arrest position, ready to help you claw over the edge if you're shy of a clean landing. With the rope now linked to the landing side, the other climbers have a less dangerous job ahead. The belay rope can help pull up on any jumper who falls just short of the target. Use caution and common sense if the leap is from the high lip of a crevasse over to a lower side. (Bergschrunds, for example, often have a high overhanging wall on the uphill side.) You can be injured in a long, hard leap. If you go for it, keep your feet slightly apart for balance, knees bent to absorb shock, and ice axe held ready for a quick self-arrest.